Time for a little real talk. Because meeting our goals is never easy. Nothing frustrates me more than my clients who pretend that they are doing their homework, whether it is the rehabilitation program their physiotherapist used or logging their food to help hold them accountable to eating well, which brings me to today’s challenge: take the blinders off and be honest with yourself about the lifestyle you are living vs the lifestyle you hope to live. This came to me this morning during a session with one of my clients. This client of mine has been trying to get the scale to go down 10-15 pounds for a few years now and I have done my best to coach them through it. I offer all the advice I can, train them multiple times a week and get them moving and working hard outside on the weekends. Unfortunately, I can’t be with them 24 hours a day monitoring what goes into their body. The problem with this is that they are wearing blinders, constantly. They focus solely on when they are being “good” and seem to completely ignore when they are being “bad”. They tell me all about the healthy smoothie they had for breakfast, or the steamed chicken for dinner but they forget to tell me about the burger and fries that they had at lunch. Or they pretend that a weekend away with good friends full of drinking and eating out will not hinder their goal of seeing weight loss. This doesn’t only apply to weight loss but it occurs in all areas of healthy living. I have clients who nag about aches and pains in their bodies and when I tell them what they should be doing, including a visit to their doctor, they ignore my advice and come back in week after week complaining about the same issues, questioning why this keeps happening. So this year, starting today, I ask you to be real with yourself. With every action you do, ask yourself is this moving you in the direction that you are wanting to go. If it is not, it is not the end of the world, but be honest with yourself when you wonder why you haven’t reached your goal. If you said you were going to cut out processed sugar but the donuts sitting in the staff room win, then remember that when you step on the scale next week. I don’t expect my clients to be perfect, nor do I expect them to do everything I say, but I do expect them to be honest and realistic in what they are hoping to achieve. Make sure your expectations are matching your actions and that you are recognize each and every action you take. 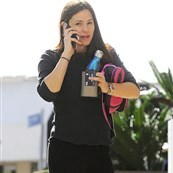 Here is Jennifer Garner at the gym the other day in LA.